Are your kids into sports. We have a colorful Sports Bounce House Wet Combo. It has 3D Sports Graphic Designs. Large netted windows so you can see your kids bouncing around. A fun and exciting slide with a pool at the end of it so your little ones can cool off after jumping around. 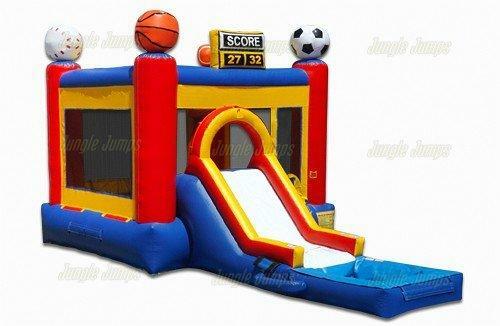 This sporty bouncy house also has a inflatable ramp with a safety neeted door so the kids can easliy climb in and out.